Hi ladies, it's Roberta Saum here, what's up? Since you're here at Slim in Seven I'm guessing you have something pretty special in the pipeline: let me guess, it's either a party, photo shoot or maybe even your wedding? Whatever it is, we've got your back. Slim in Seven was designed for exactly this situation! Get started now by clicking here to download the 7-day system, or read on to find out why Slim in Seven will work for you. Slim in Seven isn't a quick-fix to be followed at the start of your weight loss journey. We're not into short term solutions. 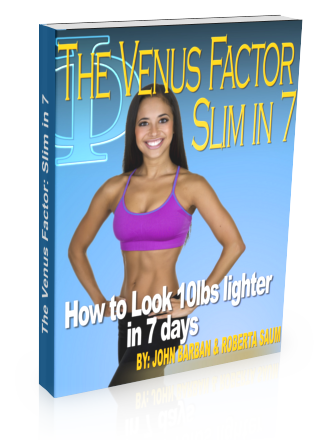 Slim in Seven is for Venus women who are already following the main Venus workout and nutrition protocols but have a really special occasion coming up and want to drop a little extra fluff, tighten up and hear some industry secrets about how to look great in photos. Back in the day, things were a little different. I know us ladies don't like to talk about our age but some of you might remember a time before smart phones, before Facebook and Instagram, a time when you could go to a party without wondering if someone was uploading a photo of your backside to social media and tagging you in it before you've even got home. We can laugh about it, but it's true! We're living in a very visual time, one of instant and immediate visibility. It's understandable that we want to look our best at even the most informal social event, let alone a wedding or photo shoot. John Barban and I designed Slim in Seven to be a step-by-step blueprint for 7 days. I've taken common practices and little-known secrets from the worlds of fitness modeling, physique competitions and photo shoots (and discarded the ones which are no good) so you can quickly get to the heart of exactly what you must do to drop excess water, tighten up your physique and improve your posture. Discover the truth about water loading and water manipulation, how to cut and load carbs, exactly how to set your calorie level for each of the 7 days, and how to play with meal timing to make visible changes. More than that, we'll talk about how to plan, learn and practice poses (ideal for a photo shoot). If you've got planned a photo shoot to celebrate your Venus success or to enter one of our contest, Slim in Seven has exactly the information you need, from planning the poses which show off your best look, to nailing that tricky rear pose. We'll even help you master the facial expressions which will take your photos from awkward to awesome! I asked some of the best in the business to talk you through little-known facts about working with professional photographers, including what you simply must know about lighting (for indoor and outdoor photos). Learn exactly what to do and what to expect in the final few days of peak week and even in the crucial final hours. You'll learn how the smallest details can create incredible visible changes when you're paying such attention to detail. I'm lucky to have some of the most successful fitness models and physique athletes in the world on my friends list, so I called them up and persuaded them to write down their must-have pieces of information. It's all right here for you. I doubt there's another book or ebook on the market right now which has such a complete and in-depth set of facts, secrets and personal tips about the 7 days leading up to a photo shoot or special event. John and l are really proud of Slim in Seven and we can't wait to hear how it helps you (thousands of Venus women are already benefiting from it, just go look inside the Venus community and see for yourself!). I know for a fact that if you follow the 7-Day plan you’re going to look simply AMAZING! And you will have those photos FOREVER, so you can look at them even in 20 or 30 years! Click on the button below to download Slim in Seven now and get started right away! …There’s no time to lose! PS: Don’t forget that Slim in Seven is a full 7-day program with your event or photo shoot taking place on the 8th day.